Dexter fans, today's the day! The DVD and Blu-ray of the eighth and final season of Dexter and the Complete Series Box Set are now available! Dexter: The Complete Series Collection (available as a 25-disc Blu-ray set and 33-disc DVD set) includes all eight acclaimed seasons in an ultra-collectible re-creation of the actual blood slide box used by Dexter Morgan to catalog his victims on the show. 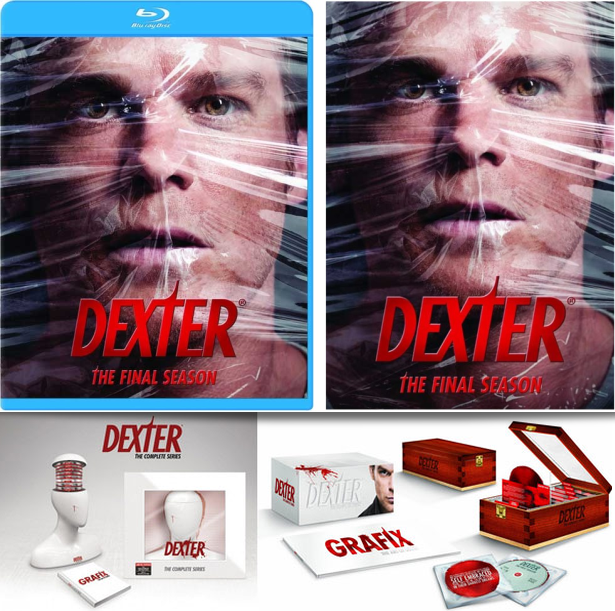 The box set also includes an all-new bonus disc with access to over four hours of behind-the-scenes cast and crew interviews, featurettes, promos; two exclusive documentaries: The Evolution of Dexter Morgan and The Code; the never-before-seen feature, Rubin Museum of Art Special Presentation: An on-stage conversation with Michael C. Hall and psychologist Kevin Dutton (The Wisdom of Psychopaths); plus Grafix: The Art of Dexter, a collection of photography, fan artwork and iconography, and images used in the series' cutting edge promotional campaigns.